“One of the most notable buildings in the world”, the magnificent SC State House, took more than 50 years and $3.5 million dollars to complete. The South Carolina Capitol it’s a Columbia must see free and truly inspirational family attraction. • In 1854 everything was torn down because inappropriate materials were used. • During the Civil War Union troops destroyed much of Columbia including the State House building. • In 1885 the architect died and a new one had to be appointed. • Finally in 1907 the fireproof State House was complete thanks to architects John M. Niernsee and his son. During 1995-1998 renovation was done to make the building earthquake proof. Here are most interesting State House attractions and fun things to know. Free guided tours are available Monday through Saturday and each start with a short movie overview. Call (803)-734-2430 to schedule a tour or check at the Visitor’s office inside the State House. On your own, best time to visit is on Monday, Friday, Saturday and the 1st Sunday of the month. To watch SC elected officials at work go Tuesdays, Wednesdays and Thursdays from February to June . Metered parking is available on all four streets bordering the State House (you get 20 minutes for a quarter). Parking is free on Sundays and after 6 PM. Make sure to stop by the Public Library (“Where the Wild Things Are“!) on Assembly Street and the Columbia Museum of Art for some amazing European and Asian art collections even kids will enjoy. 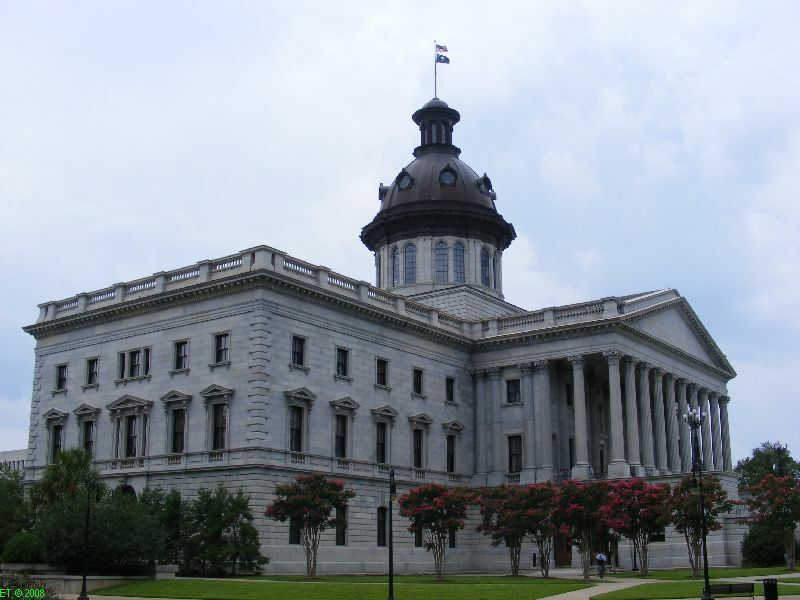 Relive history and be proud at the SC State House in Columbia!